Mother's Day has come and gone...so quickly. We do so much, often like Mom machines. I would fully support the implementation of Mother's Month! I know my family appreciates all that I do; and I do it gladly. I'll admit, however, that there are more days than I care to count when I need a lift. Anything from the bodycology line will fit the bill, for a pick me up that will pamper without breaking your budget! bodycology's new rich & creamy line, with scented body lotion and body wash, is a must-have for any Mom's pampering trove. Both rich & creamy Body Lotions and Body Wash are available in a variety of scents and formulas, satisfying the most particular Moms. Rich, but not heavy, I find the bodycology lotions to hydrate instantly, without leaving a messy residue. While the just-right delicate and playful scenting certain adds to the appeal of bodycology and how you'll feel truly pampered after use, the science of the aquation Hydration Formula is what is at work behind the scenes. 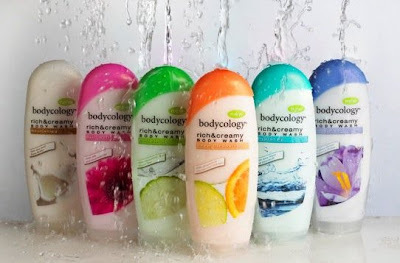 With bodycology's rich & creamy Body Wash, you can layer your scent, in a positive way! With so many delightful formulas and scents to choose from, you'll be pleasantly surprised by just how affordable bodycology products are! While, with their budget-friendly pricing, you can afford to try them all, if you want to discover just the right scent and formula for you. bodycology is generously offering That's What She Said readers a chance to win ONE of FIVE rich & creamy prize packs ~ including both rich & creamy Body Lotion and Body Wash! To be eligible to enter this giveaway, you must follow That's What She Said via Google Friend Connect (mid right sidebar). This giveaway is open to residents of the US, 18+ and will conclude on Saturday, June 11, 2011 at midnight, EST. The winners will be selected randomly from all eligible entries. The winners will be notified by email and will 72 hours to respond before I must move on to runner ups. Please leave your email address, in anti spam format, in your comment if it is not available via your comment name so I may contact you if you are a winner. Bonus entries are completely optional. If you are already liking, following, etc, please feel free to take those bonus entries. For mandatory entry, please visit bodycology and then tell me in a comment here what product and scent you would love to try. * "Like" That's What She Said on Facebook (mid right sidebar), leave a comment here with your FB name, 2 entries. * Follow Bodycology on Twitter, leave a comment here with your Twitter name, 2 entries. * Follow That's What She Said (tsue1136) on Twitter, leave a comment here with your Twitter name, 2 entries. * Follow That's What She Said (tsue1136) on Stumble, leave a comment here with your stumble name, 2 entries. * Subscribe to That's What She Said via email or RSS (mid right sidebar), leave a comment here with applicable name and method, 2 entries per method. * Enter any of my other active giveaways, leave a comment here letting me know which, 3 entries per additional giveaway. * Share this giveaway in some other fashion, stumble it, Digg it, blog it, whatever you can come up with. Sharing must include a direct link back to this giveaway. Leave a comment with a link to your sharing. 2 entries per sharing. Handy sharing button at bottom of post. * Take the What's my bodycology quiz and tell me in a comment what you discovered, 2 entries. On behalf of bodycology and That's What She Said, thank you to all entrants for following and participating! I received bodycology products to explore for the purposes of creating this feature. bodycology is sponsoring the prizes and is responsible for shipping. The opinions expressed above are both honest and my own. Images and information taken from various bodycology websites. Flower Image. Facebook is not responsible for hosting, sponsoring or anything else involving this giveaway. I'm a follower of your site via GFC as Joder. From the Bodycology site, I'd love the Vanilla Cupcake Body Cream. I "Like" Bodycology on Facebook as Jody F.
I "Like" That's What She Said on Facebook as Jody F.
From the quiz, I was told that Perhaps it’s your stress levels or your level of activity, but you need something (we’re thinking Silk Extracts and Avocado Oil) to restore it to its natural smoothness and sheen. Our Skin-Softening formula will do just the trick. I would love to try the moonlit garden scent shower gel. 2.I LIKE them on FB~ Jennifer L.
turq here.. my bloggers seems to be broke today.. so im trying to enter this way.. not cheating here..letting you know this is turq im just going for an entry. I would love to try Midnight garden bodycream! liked bodycology on facebook 1 "Andrea G"
liked "TSUE" on facebook 1 "Andrea G"
liked "TSUE" on facebook 2 "Andrea G"
entered things remembered giveaway 1 "andrea g"
entered things remembered giveaway 2 "Andrea G"
entered bendini giveaway 1 "andrea g"
entered bendini giveaway 2 "andrea g"
entered the hard candy cosmetics giveaway 1 "andrea g"
entered the hard candy cosmetics giveaway 2 "andrea g"
I would love to try the Advanced Healing Body Lotion!